It’s funny how quickly a judgment can be turned on its head. After 2006’s The Crane Wife, I had all but dismissed The Decemberists as overdone (especially lyrically) and overhyped. But with the release of The Hazards of Love (Capitol), which is even more over the top conceptually than the Japanese-folk-inspired Crane, Colin Meloy has managed to establish himself as a modern day librettist and composer of the highest degree. What seemed campy and forced about Crane seems meticulously executed and nothing short of one of the more pleasantly unique indie albums to come out in years in Hazards. If I were to break down the plot of the album, which is a narrative that listens as a string of chapters much better than it does as individual songs, you would either be intrigued at the prospect of an album about a Narnia-esque woodland universe or irritated by the pretentiousness of such decadence. The album is, without a doubt, an exercise in self-indulgence by Meloy. Who else could meld a virtuous and innocent maiden, a shape-shifting fawn, an evil rake, a forest queen, and a baffling vocabulary, but someone serving a very particular and personal artistic desire? Meloy’s perceived failure on Crane is his utter success on Hazards. He engages the listener so immediately and so emotionally that it almost doesn’t matter how fantastical or absurd his plot. An infanticidal rake? Sure, I’ll buy it! Oh, you want to call the forest a taiga for seventeen songs? That’s OK, too! There aren’t many lyricists out there that can sell such intense abstraction to such a wide audience, but much like the Japanese folk inspiration for Crane, Meloy stuck to his guns and built lyrics around the 1960s British folk revival (the album’s title comes from a 1964 Anne Briggs EP). The parallels between the critically acclaimed 2006 album (not by this critic, but apparently there are other opinions out there) and its 2009 follow-up are many and obvious. In The Crane Wife Meloy used two musical themes and built them up all through the album to convey the various moods that act as themes throughout. In The Hazards of Love, Meloy has chosen another two of these motifs to define moods throughout the album. There is the “love” theme, featured on each of the four tracks entitled “The Hazards of Love,” which varies both in tempo and dynamic intensity across all four of its incarnations. The “lust” theme on “The Wanting Comes in Waves” (parts 1 and 2) is interwoven with the march of the domineering taiga queen (also the narrator’s mother), a Led Zeppelin riff that reeks of Darth Vader’s “Imperial March”. The lustiness of the narrator’s theme and the anger of his mother’s meld brilliantly to convey a dangerous amalgam of tension and rage and want. In opera, musical themes are called leitmotifs, and they often divide the heroes from villains, the victories from the defeats. On Hazards, Meloy harkens back to this classic composing technique by combining leitmotifs with his operatically overly dramatized librettos. Meloy’s inventive method on Hazards appears to be a historically significant one. Few artists have taken such distinctively bold and obvious historical influences and turned out such successfully adapted music. Meloy’s loyalty to the operatic style of composition and lyricism is surprisingly successful not because it is simply carried out, but because it has been adapted in a way that makes The Decemberist’s evolving music accessible to the listener rather than pretentious or exclusive. As he is one of the few artists to even attempt, let alone accomplish this feat (Mastodon’s latest Crack the Skye attempts the same, with questionable results), Meloy should be lauded for his novelty as well as his increasingly obvious virtuosity as a composer. After listening to The Hazards of Love dozens of times this month, I went back and gave The Crane Wife another shot. I was surprised to find that the things that had turned me off three years ago – a pompously dramatic vocabulary, strangely connected musical lines, and unrelenting emotionality – were the same things that drew me into Hazards and allowed me to reassess and appreciate Crane. If The Hazards of Love is the endgame, The Crane Wife was a necessary and appropriate stepping stone, though it is much harder to appreciate the latter without the former. 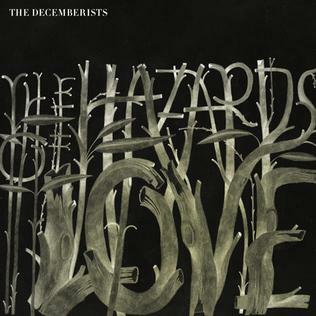 If, however, Hazards is yet another stepping stone for The Decemberists, I am intrigued to discover where the next leap will take them. This entry was posted in anne briggs, colin meloy, crane wife, decemberists, hazards of love, leitmotif, libretto, opera. Bookmark the permalink.